Though it seems that we may live in a society and culture that encourages a sense of entitlement; as parents we can still do whatever we can to raise a child who is grateful. But, in spite of our best efforts, nearly every child (it seems) will go through an ungrateful stage. That doesn’t necessarily indicate that they will be an ungrateful child forever or grow up feeling entitled to everything. The good news is that when it comes to disciplining these children, it CAN be done. Better yet, it’s probably easier than you think. 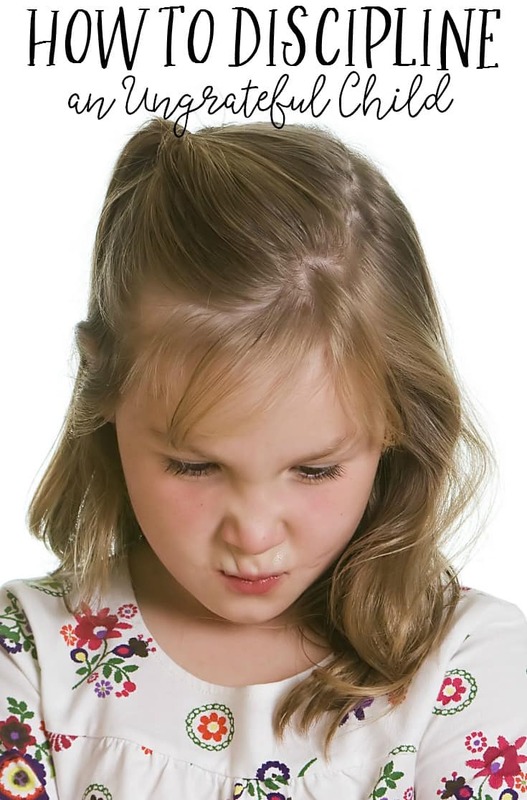 Here are several strategies to consider when it comes to effectively disciplining an ungrateful child. Remember that young children especially, don’t realize that they’re being ungrateful. You have to point the issue out to them. Once your child has been properly disciplined, talk about some of the things to be grateful for. Explain that not everyone is lucky enough to have these things and that it’s not right to take them for granted. Expand on the subject every now and then, just as a gentle reminder. Set the example yourself by having an attitude of gratitude. It’s not going to go very far, after all, if you aren’t grateful. You are also teaching them to appreciate what they have. Don’t beat yourself up for making a “deal” with your child every once in a while. For example, if he (or she) persists in asking you if he can read a book for thirty minutes after bedtime, tell him that you’re willing to make a compromise. Set a timer for 15 minutes instead. This way, everybody is happy- and it could go a long way when it comes to reclaiming the joy in motherhood. In the event your child won’t do as you say when disciplined, stand your ground. If you sound like a “broken record” it’s okay. Really, it is. Sometimes it’s the only thing that works. There’s nothing wrong with being sympathetic and listening to what he has to say. However, if the discussion comes to the point of standstill, don’t be afraid to firmly end it and walk away. It’s important to treat your child with respect, even during your most stressful moments. Exhibiting stress allows him to take advantage of the situation and makes things worse instead of better. At least for the majority of time, it’s best to only allow privileges when earned. For example, when a child does chores or helps out around the house. This way, children learn that they need to follow the rules in order to participate in activities and get rewarded with some of the things they ask for. Always reinforce positive behavior as well. This makes children feel good and reminds them that they’re on the right track. Giving children toys or other gifts in an effort to get them to act less ungratefully just doesn’t work. In fact, it causes more serious problems. When you focus more on helping others, you’ll probably find that your child’s self-centered attitude will improve. Of course, this won’t happen overnight. But, the more helpful children become, the more their outlook on gratefulness changes. As an added benefit, helping others fosters kindness and empathy as well. You can start with one of these 28 random acts of kindness. Both of these attributes will follow your child to adulthood, and there’s certainly nothing wrong with that. It also goes a long way when it comes to raising a kid who’s responsible. Child development experts tell us that ungrateful children typically don’t grow up to be exceedingly selfish or greedy. It’s something that most kids grow out of by the age of 8 or 9. So, there’s no need to panic. The best thing to do is to stay as calm as possible when these situations arise. Be firm and the crisis will pass. Remember, it’s all in a day’s work of a parent. And it’s never too late to raise a child with character. Want more strategies and support? Some sound advice, my little one is not even 18 months old but I’m working with her to acknowledge please & thank yous so when she does start talking more she can be polite and appreciate things more. This is such a great list. I try to do all of these things. Good to know that I’m on the right track. I just need to work a lot harder at keeping my cool!